Our lean pasture raised beef comes from the family owned and operated "Gentz Cattle Company Ranch" located in the great state of Texas USA. We use no growth hormones, no antibiotics, and we do not force feed grain. Animals graze outside and are not confined in stalls. We believe you will be pleased with our product. Gentz Cattle Company is a locally owned, family operated business that evolved into the business it is now when in 1979 Jimmy purchased 6 longhorn cows. With his first set of longhorn cattle, he lost the best one to a bolt of lightning. The longhorn logo with the lightning bolt through it is used because of that experience. Through the years, Jimmy and his son James have purchased more longhorn cattle and now own more than 200 longhorn cows. The cattle graze on their property in Winnie, Texas. In addition to the mother cows, Gentz Cattle has 11 bulls and 4 longhorn steers that are trained to ride. 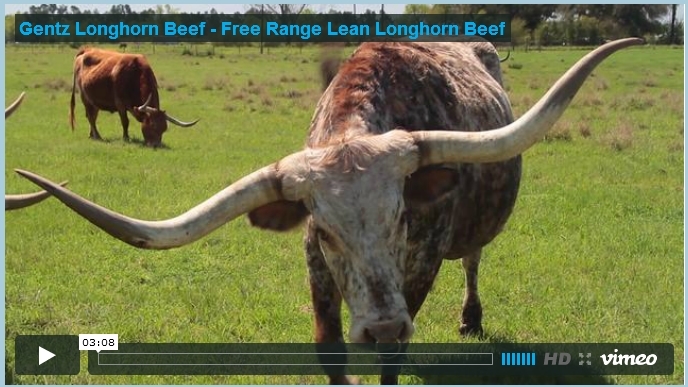 Gentz Cattle sells Texas longhorn cattle and most recently they sell the longhorn beef. In 2004, James and his wife Carol processed a longhorn calf that was raised on grass and not corn fed for their own consumption and were very pleased with the longhorn beef. They do not use any growth hormones in their calves and do not use antibiotics in their feed. They are also pleased with the processor who does their work and he does not use any chemicals in his packaging. The beef is dry aged for 2 weeks and is vacuum packed and frozen. You can purchase the beef at the ranch or on Saturdays from March through November in Beaumont, Texas at the Farmer’s Market which is located on College Street at the Athletic Complex under the basketball pavilion.